What is Austin Energy doing locally when it comes to solar? Our city-owned utility has existing goals to reach 110 MW of local solar by 2020 and 200 MW by 2025. Austin Energy has several programs to meet these goals. Recently, Austin Energy made exciting announcements, including the completion of the new 2.5 MW La Loma community solar project, a new low-income solar program powered by La Loma, and the pilot for solar available to multifamily dwellings and affordable housing, called Shared Solar. Significant changes are also being made to the residential solar incentive program. With the completion of La Loma, Austin Energy has expanded its community solar program to 400 more residential customers. Although there is only room left on the waitlist at the regular rate, the half set aside for the Customer Assistance Program (CAP) participants (low-income customers) is still open. CAP customers can now reduce their bill by signing up for the community solar program. Shared Solar will allow residents in a multifamily dwelling to receive a prorated portion of the value of solar credit from a single installation. 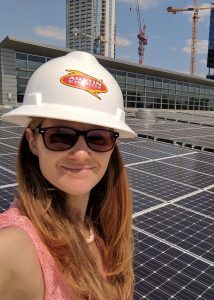 Solar Austin is excited to announce Danielle Murray, Austin Energy’s Solar Program Manager, as our March Happy Hour speaker! 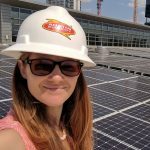 She will provide an update on all things local solar at Austin Energy: on the La Loma Community Solar project, the low-income solar program, Shared Solar, the upcoming changes to the residential solar incentive program, and progress toward Austin’s local solar and other renewable energy goals. Tuesday, March 27th, 5:30 – 8:00 p.m.
Danielle Murray is Austin Energy’s Manager of Solar Energy Services, overseeing the utility’s renewable energy offerings and local solar programs. These include the wind-based GreenChoice program, Community Solar program, residential and commercial solar incentive programs, solar inspections, and the Value of Solar rates. Previously, Danielle was the Renewable Program Manager for the City and County of San Francisco, where she led efforts to develop the local solar market, reduce soft costs, and implement innovative financing mechanisms; coordinated wind, wave, and district energy research and development; and served as chair of the Mayor’s Renewable Energy Task Force. Prior to that, she worked for the City of Toronto’s Energy Office, where she designed and implemented the Toronto Neighborhoods Initiative which provided grants and low-interest loans to homeowners to install solar water heating systems and other energy efficiency improvements. We hope you will join us Tuesday, March 27th for this update on Austin Energy’s solar programs. There’s lots of change happening right now, and this will be a great chance to ask your questions. The Pedernales Electric Cooperative (PEC) is going big with community solar. By the end of 2018, the co-op expects to have 15 MW online at five sites throughout its service territory. These local solar installations will be used to provide power to participating co-op members (customers) at a set rate. This is great news for customers who don’t have access to on-site solar—whether it’s because they can’t afford it, don’t own their own homes, or don’t have roof or are on land that isn’t suited for solar. And since participating co-op members will reduce their electric bills compared to the regular PEC rates, it’s no wonder that over 1,000 members signed up in the first day that the program opened for subscriptions in December. If you’re a PEC member, you can sign up here. PEC is investing in low cost solar to reduce more expensive power purchases from the Lower Colorado River Authority (LCRA), which relies heavily on the coal-fired Fayette power plant. Once again, solar is benefiting the environment and reducing costs. Solar Austin is excited to announce that Jim Spaulding, Director of Project Development Energy Services at PEC, will discuss the co-op’s new community solar installations at our February happy hour. Tuesday, February 27th, 5:30 – 8:00 p.m.
At PEC, Jim Spaulding is responsible for developing and implementing new value-driven energy products and services that will advance and improve the cooperative’s performance in meeting its energy demands and developing strategic goals. 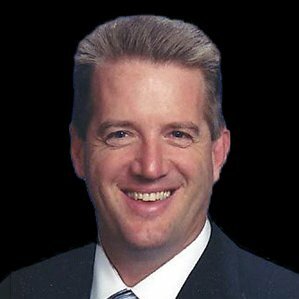 He is an experienced professional in the utility, energy solutions, and water markets, as well as wastewater facility enhancement, with a proven track record in team building, specialized sales recruiting, and driving growth. We hope you will join us Tuesday, February 27th for this exciting discussion about PEC’s community solar initiative! These are exciting times in the energy world. Utility-scale solar is cheaper than new conventional power plants—and sometimes even cheaper than operating existing coal and gas plants. Solar and wind energy continue to expand and become even more economic. There’s lots of buzz about energy storage and some utilities are starting to invest in it. But what innovations are taking place in research laboratories, and what technology may soon leave these research labs and head to commercial use? Several Central Texas institutions are part of the Center for Next Generation Photovoltaics—where industry and thought leaders are answering these questions. Solar Austin is excited to kick off 2018, a year certain to be filled with even more innovation in renewable energy, with a happy hour talk by Dr. Taylor Harvey from the Center and TAMU-Central Texas on innovation in solar technology. Dr. Harvey will share his outlook on the future of solar and discuss research into developing printed solar cells on paper and plastic substrates. He will also share some of his experiences running a printed solar startup based here in Austin. Tuesday, January 23rd, 5:30 – 8:00 p.m.
Dr. Harvey is the Chancellor’s Assistant Professor of Research at Texas A&M University—Central Texas. His primary area of research is solar energy with a focus on new solar materials (such as solar paints) and solar microsystems. He is the co-author of nine peer-reviewed articles and two patents. Before starting his current position, Dr. Harvey co-founded and led Lucelo Technologies, a printed solar start-up. 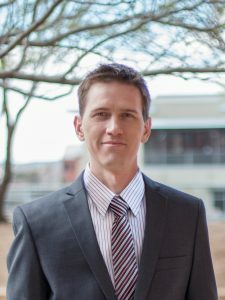 Dr. Harvey received his PhD from the University of Texas at Austin in 2014 after spending four years as a reservoir engineer in the traditional energy industry. We hope you will join us Tuesday, January 23rd for this fascinating discussion!